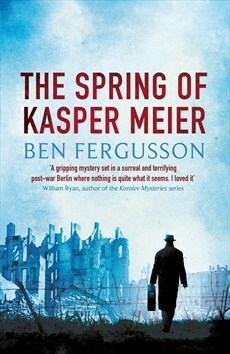 Ben Fergusson’s debut literary thriller is a tale of survival and the triumph of love over despair. Its setting is masterfully evoked: post-war Berlin under the rough and ready control of Allied troops, the once great city reduced to a sea of rubble. Necessities are scarce and its defeated populace sift the ruins to rescue bodies and possessions while columns of gaunt, exhausted refugees trudge by. It’s a place where there’s little kindness and even less hope. Here we meet Kasper Meier, fiftyish, an ex-bar owner with a blind eye, dependent on black market dealing to feed himself and his ailing father in their bombed out apartment. Illegally trading shoes and canned food for penicillin and tobacco is not all that could get Kasper into trouble. There’s the matter of his sexuality. Kasper is still in deep mourning for the loss of his lover, Phillip, beaten to death by the Nazis, and is frequently visited by memories of him, some tender, some disturbing. A recent, comfort-seeking affair with a plaintive, soft-eyed individual named Heinrich Neustadt has been put behind him – or so he thinks. If this all sounds bleak, take a deep breath, everything is about to get bleaker, but keep reading, the book is worth it. A bright-haired young rubble-sifter named Eva arrives at his door with the request that he find a British pilot who has left her friend pregnant. At the same time a sinister teenage duo, apparently the children of Eva’s supervisor, the shadowy Frau Beckmann, start to menace Kasper. His reluctance to involve himself in military affairs by helping Eva is met by threats of blackmail. Setting aside the schematic elements required by the genre, what is impressive about this historical novel is its lack of sensationalism, its quiet ring of veracity. Meier, despite the topical theme of his sexuality, is allowed to be a creature of his time and place, an ordinary man who has tried to be dutiful and loving, but has been crushed by circumstances. Yet the themes Fergusson addresses are timeless. His rendition of 1946 Berlin reminds us of pictures we see on our screens of war-torn modern Gaza or Syria. He achieves this effect by not over-burdening the narrative with historical background. He also demonstrates in his writing a deep humanity. Despite the increasing grimness of events as the narrative unfolds, a welcome light begins to glimmer, for a growing friendship with Eva melts Kasper’s wintry heart. Only after he agrees to assist her does he realize that there might be a dangerous connection between her quest and a puzzling series of random murders of members of the occupying forces in Berlin. Much turns out to be not what it seems as he fathoms out how to save Eva, his father and himself. Sometimes the twists and turns were a bit difficult for this reader to follow. A slow burn it might be, but The Spring of Kasper Meier remains true to itself to the end, while delivering considerable emotional power.